Nancy:Ty to my father, my daughter was just born and I needed food and diapers bad. He traveled from Navarre to north canton and went to acme and completed my list. Husband was out of town, thank you dad love you for helping us. Maureen: Yes. 77 and 78. Was driving back on Friday after thanksgiving. Down Carnegie. Rush hour was supposed to be over but it wasn’t. I was past the hill when I came across 6 lanes of traffic coming at me. I had to drive on the sidewalk!! When I finally got on the freeway I was driving blind. I guessed at the exit in Berea b/c all the signs were covered in snow. A 45 minute drive took me 3 hours. I could have been in Columbus!!! So yeah, I remember those storms. Larry:My wife was subjected to that blizzard in Watertown, NY. Stuck at work 3 days. Snow up to second floor of homes. Emergency prescriptions were delivered by snowmobile. Bob: "We had guests from I-76 stay overnight because their car was stuck." Jeanette: I remember no heat in the house for a few days. We huddled around the fireplace in the family room. 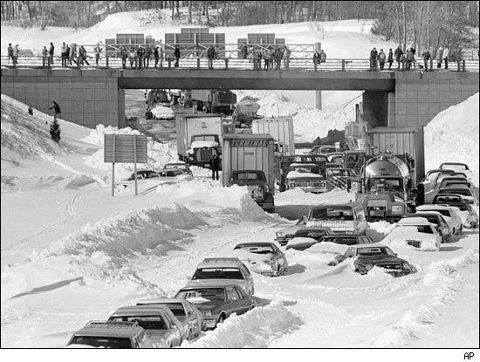 Do you remember the t-shirts later that year that read "I survived the Blizzard of '78"
Joe: I was caught in it. I got on the Ohio Turn Pike just before they closed it and had to "feel" my way home, which was about 60 miles away. I had a Ham radio in the car and my Ham friends kept tabs on me as I crept along. I made it safely and I now have a great story to tell. Joanna: I remember. Dad took coffee and soup to the Ohio dept of transportation so they could eat and keep warm while working so hard to clear roads. Skip: Remember it well. Thunder and lightning in a snowstorm! I had an old 52 CJ2 A jeep, with a Chevy V8 in it. Got a lot of supplies to people that couldn't get out with that thing. 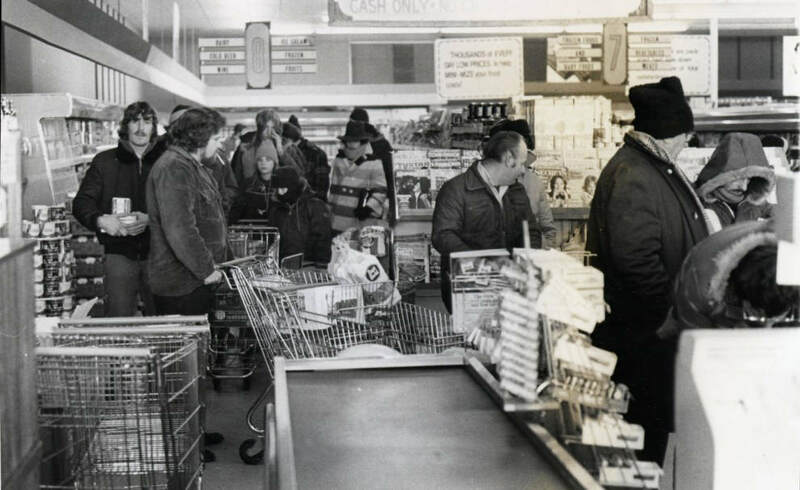 Barry: The blizzard of 1978 started with a huge thunderstorm. At that time I lived in Bettsville, Ohio. The huge amount of rain transformed into a bone chilling freeze. My car was frozen to the ground. We were able to communicate by radio. Our fire department worked round the clock helping people get groceries and fuel. Everyone pulled together!!! 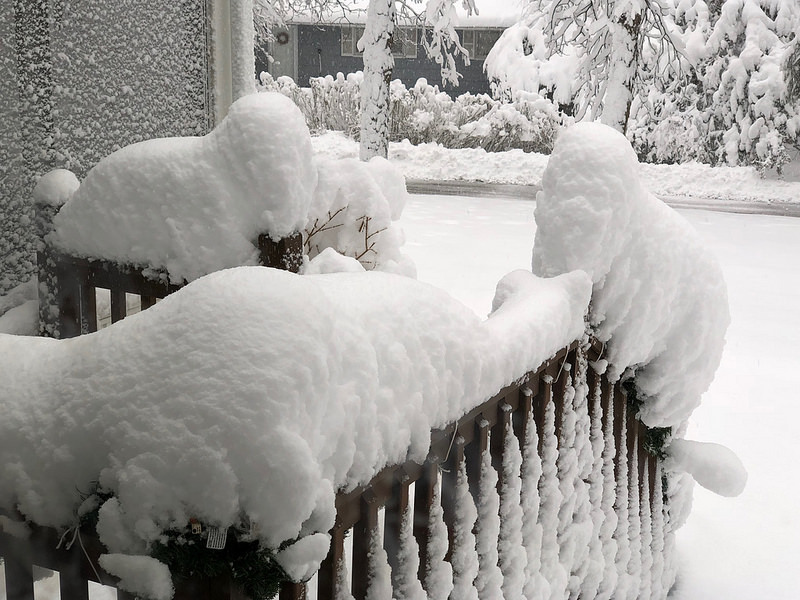 Steve: Next to my home was a 12 ft. deep ravine, The blizzard filled it in to 2 ft. above the top. I was not at work but those that were, were stranded there for 2 days. Marge: Oh yeh. Had taken my husband to work on Arlington Rd., came back to N. Canton to get my hair done at the little shopping strip across from MaMa Guizzardis. All of a sudden I couldn't see my car, at the curb! Took me about 2 hours to get back up to Arlington, going up thru Union town because 77 was a disaster. Then back to Hoover High to get my kids!! Just wanted to get my chicks all in the nest!!! Very stressful day, for sure!! Larry: I DO I DO We has snow all the way across the front of the house up to the roof peek. Dad and I had to shovel a tunnel to then across the front of the garage door to get the tractors out with the snow plows on them. there was so much snow it took over a week for out county road to get opened up. Mon and Dad were always in town and at work when the blizzards started and we were at home since school was closed. Joyce: I was in Ohio and I have no recollection of this one (maybe we had a snow party). Many years later we had a dump of 1 1/2 feet and we left before the snow to ski at Snowshoe WV. When we came back we found out the kids didn't miss school at all since it was closed the whole week. Brenda: Woke up and there was snow on our blankets because it had blown through the window. Susan: I remember it was a winter wonderland! Our kids built an igloo on our street and Marietta College campus had huge snow sculptures on the campus! Donna: I remember Mandy was 3 months old we lived in a upstairs apartment Had to put blankets on the windows cause snow was blowing in through the cracks of gram of window old two story house. up at 5:00 am, no electric, wind, snow and loud thunder! We all jumped in bed together. We were saved by Tommy. He had a transistor radio! We were able to find out what was going on. I was pregnant with Tiari! Edward: I remember it like it was yesterday. I had planned to talk to the military recruiters 3 or 4 miles from my house. I WALKED there IN OVER A FOOT OF SNOW and joined the navy. A couple weeks later I was on my way to basic training. Jim: Our house lost power so we went to grandparents house. Still no power but gas stove kept us warm. A lot of people helping other people back then. We (LU) were out of school for three or four weeks. There was a sixteen foot drift at Basil and 204. Front end loader that dug the road out unknowingly to the operator, picked up a van and set it down in the adjacent field. I had a wonderful time during that blizzard. One of the most memorable winters of my youth. Terry:I was out in it. We were driving by 7 hills rd and all of a sudden the car was up off the road.I went to see what it was. I was on the trunk of a car! We turned around to follow the snow plow. When we got back to town, it occured to me I should have checked for anyone in it! I called the sheriff and they went and checked. Ron: I remember it well too. We lived back a quarter of a mile lane in the country. We left the garage door cracked for our cat to come and go. We woke up the next morning to find a snow drift almost over the car in the garage. You also could walk right on top of this big drift in front of our house onto the top of our ranch home. Kathi: I was in NY working for a company that published educational audio/visual aids - pre-VHS....working on a scientific catalog and had to call a company in Cincinnati for information. I called all day with no answer. Finally around 5 someone answered who said, "We've had snow. A lot of snow. Don't you read the papers?" I didn't read the Enquirer back then. Matthew: My dad shoveled the drive because he had to get to his store. I lived on a street that the border of 2 cities ran down the middle. The plow truck came down the other side and dumped all the snow in our apron. I've never ever seen my father more upset. Deanie: I'll never forget that. Bill walked to work at the phone company to help restore service. Then he brought milk and diapers for our 9 month old son at lunch time. Bill: YEP - lived in Dogwood Lakes at the time...We were blocked from getting back to our home for three days...Had to snowmobile to and fro checking on neighbors...The plow came through and we had ten feet deep paths back to the homes on the lake. Garry: I remember it well. That was the day we came back from five years in Hawaii to Tennessee. No coats, no winter cloths, plane couldn't land in Dallas because of ice so it took us straight to Nashville. Of course we didn't have a ride when we got there. Finally bummed a ride from a taxi that had come up from Arnold AFS that finally got us back to the visiting quarters. Cars and trucks off the road the whole 70 miles down there. Kids had never been in snow, they had seen it from a distance on Mona Loa. They still talk about how bad they hated it and they thought we were refugees. Pamela:I sure do. No electricity for a long time made me really grateful that I was in my new house. The road was blocked by a literal mountain of snow and they got a 1 lane passage opened, dangerous and not straight so you definitely hoped you wouldn't meet another vehicle in the middle. And then the night (in the middle of the night) when the cat from the landfill came down the road and opened the dangerous passage. That thing rumbled so loudly that I don't think anyone could have slept through it. The whole storm was exciting and scary but a neighbor had a CB shop with police band monitors and he kept us informed of the progress of the electric company workers who were struggling through the storm to get the power restored. I think we were all praying for them and cheering their tenacity and progress. What a storm! Connie: I worked at the Newark Air Force Base. The base and everything else closed down that day. Woke up to thunder and lightning with the snow falling and blowing. A guy that worked with my brother died trying to cut across the fields to get home after his car got stuck out in the country in Kenton, Ohio. He wasn't the only one who lost his life in that storm. That was a crazy day I will never forget! Jeannette: I remember this so clearly! Working at Firestone Country club for a ski company that rented cross country equipment for touring the golf course. Got there that morning a half an hour late and was unable to ski the course for the customers lined up at the door. One of the couple's got lost, whom I eventually found...what a mess, I was the ONLY employee who showed up but got fired because of the lost couple. Only job I ever got fired from...17 years old! Never forget that blizzard! Laurie: Skip got stuck in it by the airport on his way to work....8 hours in his car. Thank God he filled up the gas tank that morning. Was rescued by the National Guard and taken to NASA. A Guard brought him home the next day. His car was impounded by the police for leaving it on a main road. The fact that it was buried in snow and couldn't be moved didn't matter to the Police! I remember this storm well!!!! Mary: We lived in Reynoldsburg. We evaluated people to the High School and real sick people to hospital! We were not allowed to go out not unless we were in police car since we were at police department taking emergency calls! I know the National Guard reported they had run over a clump of snow and discovered there was a Volkswagen underneath it! Nila: It was our daughters first birthday so when none of the relatives could make it to her party we went around the neighborhood and invited all of the neighbors over so the food would not be wasted. Sharon: I remember it well. I left my home in NE Columbus to go to work on the west side. Wound up on an exit at Sawmill, then pulled into a driveway, so scared I was crying. A young man came out and invited me into the house. Turned out it was the home of the chief of police in Dublin. I stayed for a few days, until it was safe to drive home. He pulled the officers off the road because it was too dangerous to be out, they all stayed in the basement. Really great people. Marilynn: I remember seeing the drapes in my 100+ year old house blowing away from the windows that night, tho they were closed. My (then) husband was at work on 3rd shift, but was able to get home. The next day we drove up 25 A to rescue a friend in Piqua who had no power, heat, etc & on our return to Troy, discovered that we were the last car permitted on that road...they closed it off near Dettmer hospital due to continued drifts . 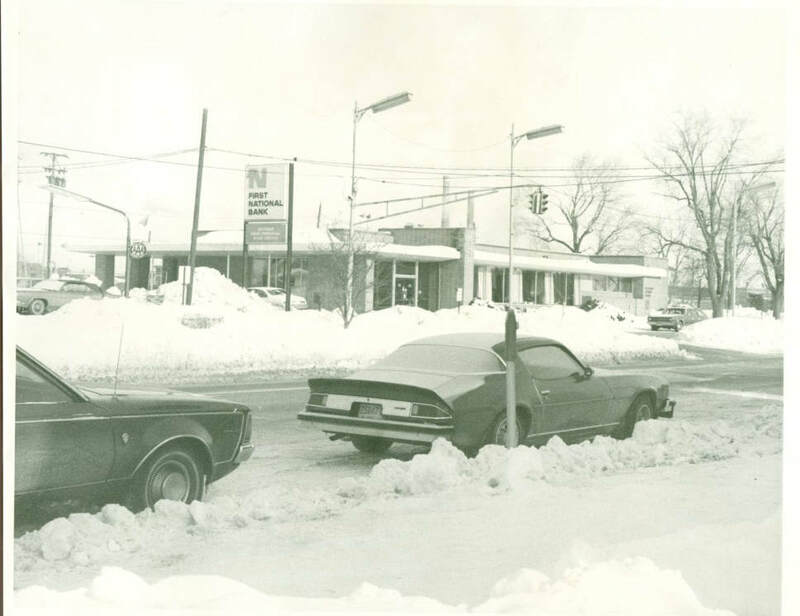 I also remember everyone living on the block getting out with shovels, etc & digging out the cars from the drifts, moving them so the plows could get through. We all worked together...young & old.